Produktinformationen "Fast & Fun Korean for Short-Term Learners 2"
Warming Up, in which vocabulary and expressions used in real situations are introduced, Pattern Practice, in which each unit’s key expressions are introduced, Key Grammatical Patterns, in which selected grammatical patterns from the main dialogue are explained, Conversation Practice, in which learners practice substituting vocabulary and expressions using given model dialogue, and Task 1 (Speaking), Task 2 (Reading & Writing), and Task 3 (Listening), through which the material studied in each unit is reviewed. Designed with the short-term learner of Korean in mind, ‘Fast & Fun Korean for Short-Term Learners’ is a 3-volume quick mastery textbook series that introduces everyday vocabulary and concrete situational dialogues practical for living in Korea. 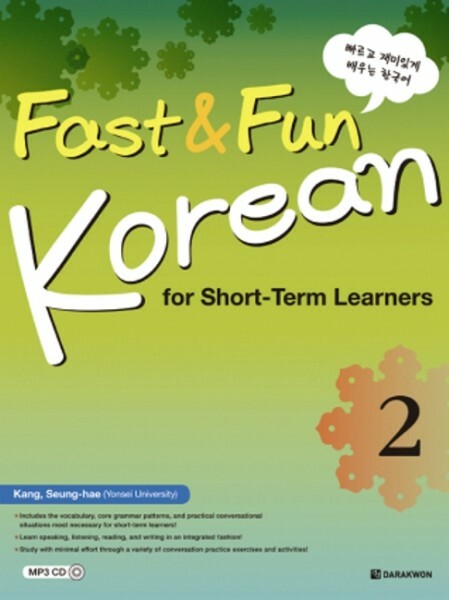 This second volume of the series, ‘Fast & Fun Korean for Short-Term Learners 2’, is classified as 'Low Intermediate' in level of difficulty, connecting the first volume 'Basic' level with the third volume 'Intermediate' level. ▪ Essential vocabulary, grammar patterns, and dialogues chosen based on their real-life usefulness. ▪ Comprehensive approach incorporating speaking, listening, reading, and writing skills in a variety of task exercises. ▪ Linked study and review process of Warming up – Pattern Practice – Key Grammatical Patterns – Conversation Practice – Tasks, allowing learners to proceed through the text with ease. ▪ Includes various illustrations and photos for quick and easy understanding of the content. ▪ Emphasis on developing in a short period of time the learner’s Korean communication ability for real situations, much like training a short-distance sprint runner as opposed to a marathon runner. Unit 01 한국에 온 지 6개월 됐어요. It's been 6 months since I came to Korea. Unit 02 드시고 가실 거예요? Will you be eating here? Unit 03 교통카드는 어디서 충전해요? Where can I recharge my transportation card? Unit 04 이 가방을 반품할 수 있어요? Can I return this bag? Unit 05 금연석으로 드릴까요? 흡연석으로 드릴까요? Would you like a non-smoking table? Or a smoking table? Unit 06 감기인 것 같아요. You seem to have caught a cold. Unit 07 십만 원에서 이십만 원 사이면 좋겠어요. Something between 100,000 and 200,000 Won would be nice. Unit 08 백화점 세일을 시작하는데 쇼핑하러 갈까요? The department store's starting a sale, so shall we go shopping? Unit 09 저 앞 건널목에서 세워 주세요. Please stop at that crossing up ahead. Unit 10 3박 4일 여행을 하려고 하는데요. I'm wanting to go on a 3-night, 4-day trip. Unit 11 여기가 청계천이라는 곳이에요? Is this the place called Cheonggyecheon? Unit 12 자리는 창가 쪽으로 주시겠어요? Could you give me a window seat? Weiterführende Links zu "Fast & Fun Korean for Short-Term Learners 2"
Unser Kommentar zu "Fast & Fun Korean for Short-Term Learners 2"
Kundenbewertungen für "Fast & Fun Korean for Short-Term Learners 2"